I finished the iPhone Field Guide by David Sparks last week. It’s a great iBook for pretty much anybody that uses an iPhone. I bought a copy for someone in my family that’s a not very technically oriented. I also enjoyed the book as I would any well written article about iPhone apps and workflows. I think that’s a great description for potential readers that are hesitant to buy an iBook about an iPhone. 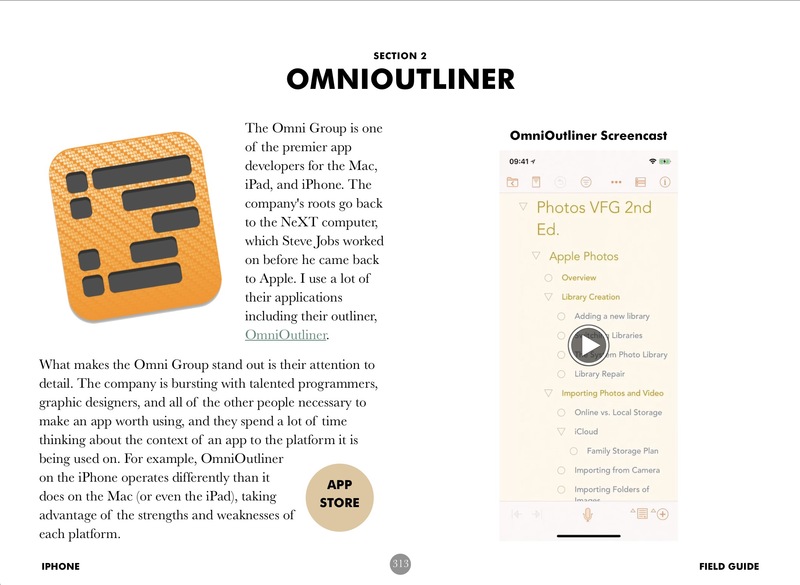 The iPhone Field Guide is a like an entire collection of succinct mini-topics ranging from app suggestions to general workflow tips. It’s the kind of thing I seek out on the internet, all nicely laid out and organized. The iPhone Field Guide is also nice on the eyes. The layout gets right to the core of what I want. Give me a reason to care. Give me a quick video to show me how it works. Finally, give me a way to get the app. This all happens on one page for many of the topics. There’s also plenty to like if you are a seasoned iPhone user. There are dozens of app recommendations, which is catnip for iPhone nerds.